The patient is a 65 year-old man with chronic tobacco use. He has a remote history of lung cancer that was successfully treated with stereotactic body radiotherapy. On a follow-up surveillance PET scan he was found to have a new 1.9 x 1.3 cm RUL apical lesion with increased FDG activity. Additionally, a second RUL tissue nodularity was detected along the lateral pleural surface of the RUL and appeared to erode the lateral aspect of the right second rib. The second target also showed increased FDG uptake concerning for malignancy. He underwent a combined Navigated Bronchoscopy and SPiN Perc™ procedure that confirmed both lesions to be Squamous Cell Carcinoma. Given his poor surgical candidacy, he was referred for fiducial marker placement for SBRT. The Radiation Oncologist requested triangulation of each lesion with the .75 x 5 mm fiducial markers. 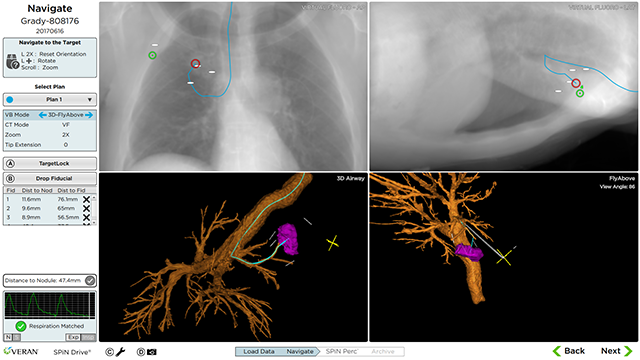 Dr. Flenaugh used SPiN Planning™ to create 3 endobronchial plans to place fiducials (one medial to the apical nodule and two lateral to it, sitting in between both tumors) and a 4th plan with a percutaneous approach lateral to the pleural tumor. This essentially created two triangles around each lesion using one shared border. 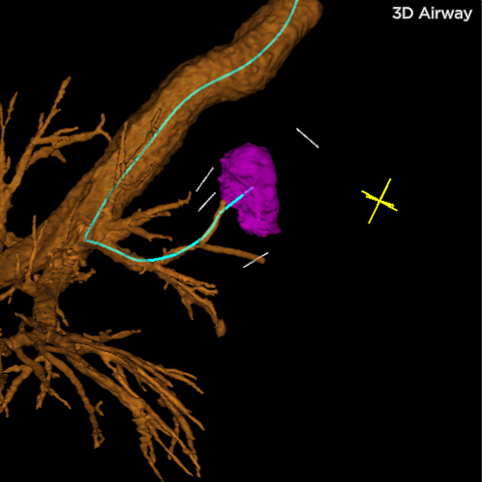 Veran’s Inspiration/Expiration CT scan protocol was performed with a vPad™ placed prior to the procedure start. 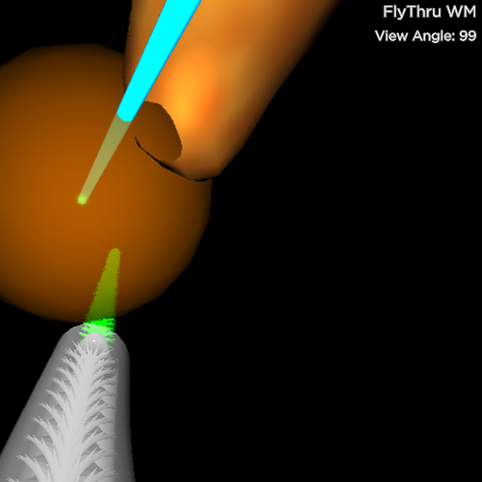 Dr. Flenaugh started with an endobronchial approach, loaded a fiducial marker into the Always-On Tip Tracked® brush, and deployed around the apical lesion. This process was repeated for the two other endobronchial plans. Dr. Flenaugh then seamlessly transitioned to SPiN Perc™ and used the transthoracic needle to access the pleural based lesion and deploy a fiducial marker at the target location. 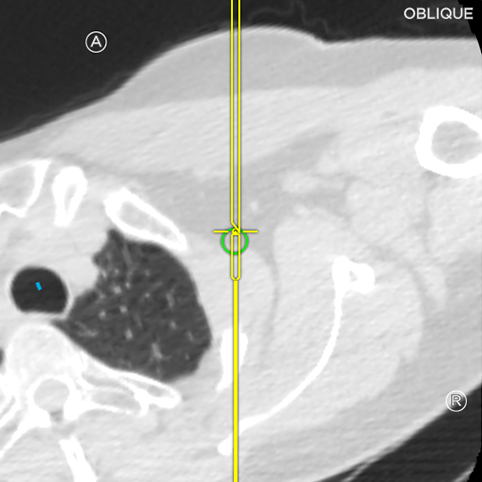 The patient was referred back to the Radiation Oncologist to begin SBRT with curative intent.